Page 3 | Alien Hand Syndrome | This comic may not contain any actual aliens. It’s been around five months since I injured my shoulder. At first I stubbornly kept drawing through the pain, but soon decided to put the comic on hold in order to rest and let the injury heal. However, after all this time it still hasn’t gotten better. I guess it’s safe to assume this will not go away on it’s own, and might even require surgery. Sadly, x-rays didn’t show anything, so the next step will probably be an MRI the coming weeks. Anyway, I can’t just not draw. Doing nothing has wrecked me even more mentally and physically. I gained a few pounds, my place is a mess and I’m crying a lot. If rest is not helping me recover, I might as well draw. I think the dream of doing the comic in color is well and truly dead now. Even the newest b/w page made my shoulder feel like a sea of fire. I’m not sure how far I can scale back the detail without readers hating it. But maybe I can find a more efficient way of doing things that won’t look half bad. I’ll still do some colored pieces every now and then, like the one at the bottom of this post. That’s it for now. I will update the comic when I can, just don’t expect too much of me. It’s been four months since I injured my shoulder and it still hasn’t recovered. I’ve been doing physical therapy, but 200€ in and I’m not even sure if it helped at all. Strangely there have been days where I had no problems at all, and I was optimistic that it was getting better. I drew new pages on those days, but a few days later my shoulder is acting up again. So yeah, I won’t be updating the comic for a while and I don’t know how long it’s going to be. Sorry. Tightened up the screen-tone graphics. No new page this week, but I updated some old pages! The more it became clear to me that I would be working on AHS for a very long time to come, the more I disliked the earlier pages for various reasons. I knew completely redrawing them was out of the question due to issues with my wrist and how long it would take. So I settled on slight tweaks here and there, without compromising the update schedule. I’ve actually come to rely on that Patreon income a bit, it’s not my full-time job yet, but it’s getting there. I’ve been working on the remake on and off for a few months, but I had to stop at page 25 for now, because the wrist pain was getting worse again, and I don’t want to go back to the time where I couldn’t update the comic for months because of it. I’m definitely getting more done than I could before though, not sure what I owe the improvement to, but the Yiynova definitely helped. One of the more extensive changes. Oh and if your browser still has the old images cached you might have to refresh the pages manually. Earlier I wrote about my health issues and the fact that at least some of them are probably caused by bad posture due to crappy setup, or at least they are exacerbated by it. In response a few readers have donated money, to help me afford something that might make for a more ergonomic setup. I mentioned looking at the Yiynova MVP22U as one possibility. So, now that I am well on my way to afford something nice, it might be a good idea to step back and explore my options a little. The MVP22 is nice, but apparently Yiynova will release three new models really soon. It might be a good idea to hold on to the money until then. 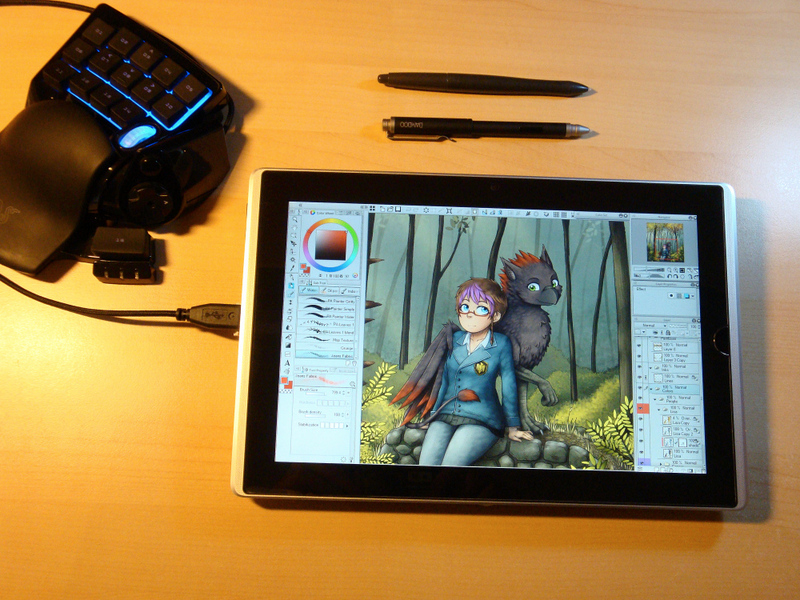 It also might be an idea to investigate some tablet-pcs like the Surface Pro or the Cintiq Companion etc. I recently un-retired my old EP121 and drew a thing with it. 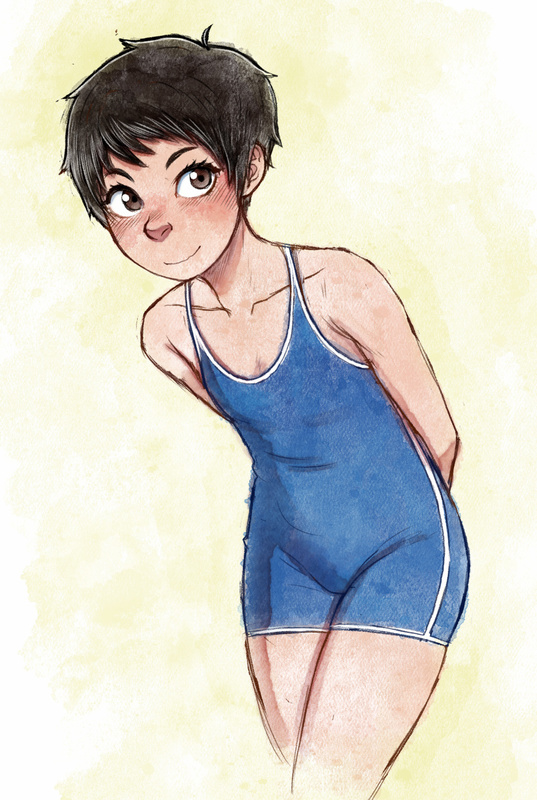 Here, have a sporty watercolor Mina! The thing I really like about tablet-pcs is the ability to move them anywhere. They’re not tied to a desktop because there’s a computer in there, but that’s also one of the drawbacks. The only reason I retired my EP121 in the first place is because it’s getting old. It only has 4gb ram and can’t be upgraded beyond that. I need at least 8gb now that I work in color. Newer tablet-pcs are roughly twice as powerful as the EP121 and should be able to handle my workload without problems. I’ll compile a list of options I’m considering soon. I did a lot of research into Cintiqs and their alternatives in the past few months and hopefully it might benefit others as well.